State Treasurer Dale Folwell says a revised Senate Bill 117 would eliminate some costly benefit options and impose forfeiture of retirement benefits for some criminal offenses. He supports the changes, which are intended to protect the underfunded system. “We have to simplify this plan … to make sure money is not leaving the plan that shouldn’t,” Folwell said Tuesday, Dec. 4, during his monthly Ask Me Anything teleconference with reporters. The resulting costs far surpass the amount originally calculated to cover a vested state employee through life expectancy, Folwell said. He cited the example of a retiree naming a child as beneficiary of his retirement payments. Doing so extends payouts much further into the future. The extra cost isn’t figured into the retirement system’s financial obligations, adding to its unfunded liabilities. Retirees also can take back pension benefits they signed away if the child dies before them. The State Employees Association of North Carolina supports S.B. 117, which the House passed on second reading Tuesday. The 63-35 vote included crossovers from both parties. “We really believe firmly that we’ve got to do everything we can to avoid this system getting into the kind of shape” other state retirement systems are in, Ardis Watkins, SEANC spokeswoman, said during a House Pensions and Retirement Committee meeting Monday. “We’ve been in this room for a couple of decades saying we want this pension plan to be taken care of. We expect accountability and transparency,” Watkins said. SEANC has been advised the underfunded retirement system could shift from a defined benefit plan which guarantees retirement payments. An alternative defined contribution plan would provide a set amount of money employees could invest in retirement plans they choose. 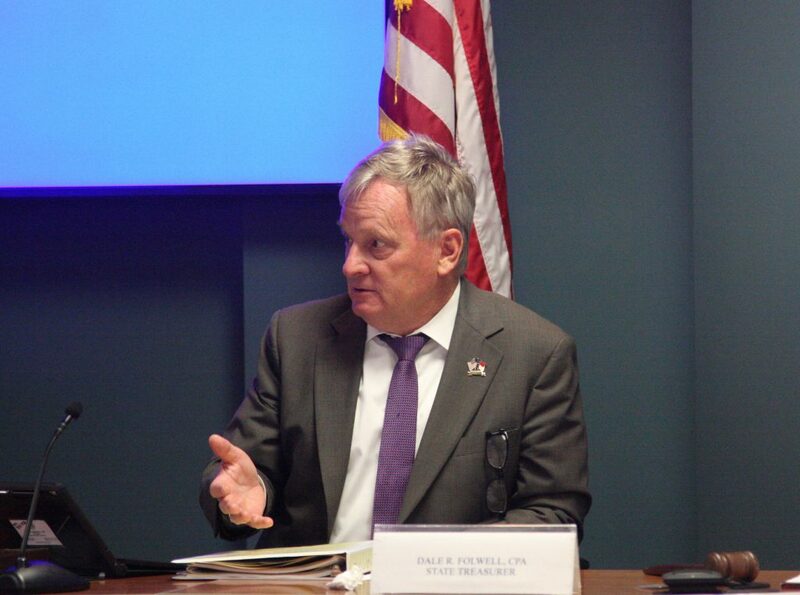 “As long as I’m the state treasurer of North Carolina I’m going to figure out how to preserve and strengthen the defined benefit plan, but with that comes the responsibility of figuring out how to sustain it,” Folwell said. You can’t have a plan with no minimum retirement age, has not earned its assumed rate of investment return on average the past 20 years, is unlikely to hit that target in the next 20 years, and is dealing with longer life expectancies — thus more payments — than anticipated, Folwell said. “On a gross basis we’re going to pay out more in pension benefits this year than equal, or approaching the long-term debt of North Carolina,” Folwell said. Retirement system payments will exceed $6 billion this year alone. Reps. Marcia Morey and Mickey Michaux, both Durham Democrats, objected to the changes during committee debate. They said bill sponsors violated House rules by missing a 9 p.m. deadline to give notice the night before a bill is introduced. They said state employees would lose constitutionally vested rights. The N.C. Association of Educators opposed the revisions for the same reason. “That would require a judge to decide,” said committee Chairman Allen McNeil, R-Randolph, drawing criticism from Michaux that the bill could end up in litigation. “Y’all are going to do what you want to do,” Michaux said. Democrats said S.B. 117 is in conflict with legal precedent in the Bailey v. North Carolina case which prohibits denying a state retiree vested contractual rights. The 1989 case enforced a settlement in which the state reimbursed employees $799 million. At the time the U.S. Supreme Court ruled states which exempted from taxes state and local employee retirement payments had to offer the same exemption for military and federal employees. Instead of extending the tax exemption to military and federal workers, the state repealed the exemption for hundreds of thousands of state employees. Rep. John Blust, R-Guilford, defended S.B. 117. Folwell disagrees that the changes conflict with Bailey. “Changing these options is something that Gov. [Roy] Cooper voted on himself in the 1990s” as a member of the General Assembly, Folwell said. Under S.B. 117, judges who are convicted by impeachment or removed from office by the Supreme Court would not receive retirement benefits. They would be reimbursed for their own contributions to the system, plus interest. Retirement forfeiture rules would be adjusted for state employees convicted of work-related felonies. Another provision would prevent pension spiking. Folwell and lawmakers have complained that state agencies sometimes grant large pay hikes to employees shortly before they retire to increase their pension amount.